I'm a fan of big bold flavors and when that combines with travel it's even better. Recently while on a trip to New Mexico I discovered a new recipe that I've now fallen in love with but have never seen outside of the state. It was a deliciously bold combination of red chilis and tender chunks of meat that almost melt in your mouth. So, like any self respecting foodie, the moment I got home I searched for what was in it so that I could make my own version of Carne Adovada! 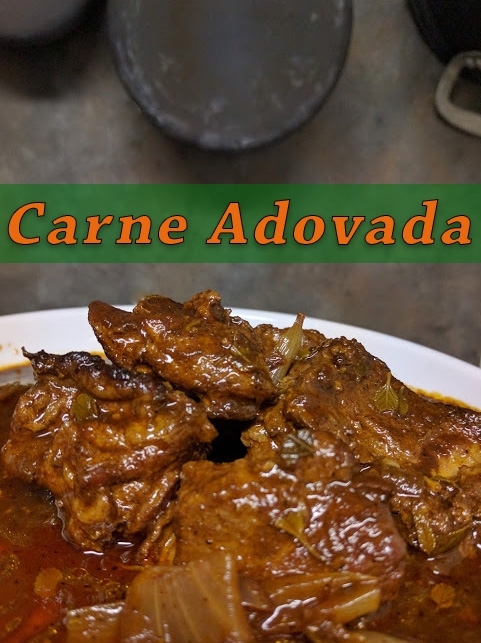 One of the things that I love about Carne Adovada is that it is essentially a riff on one of my favorite types of meat - slow cooked pork. This is a gift from the gods since pork shoulder is so deliciously fatty and the meat is incredibly tender once it has been sitting in juices for several hours. Of course, I would say that it's even better slow roasted over a smoking pit for half a day, but alas I don't have a pit in my loft so we're going to have to stick to the crockpot. However, you can also make this easily in an Instant Pot pressure cooker as well. While I absolutely love slow cooked pork, there's one thing that I think everyone can agree on, and that it's relatively bland till you add "something" to the recipe. In the American south that's BBQ sauce and in the American Southwest it's chilis. Once that sauce hits the meat then boy oh boy it's a whole new ballgame with big bold flavors that make you crave having another serving. Or in my case figuring out how to make it from scratch once I got home! Take the chilies and place them in a large cooking pot on high and toast them till you start to smell a delicious [what] smell, but be sure to keep turning them so it doesn't smoke. You'll notice that the chilies will start to puff up and blister but don't worry as long as they don't burn. Pour the wet ingredients (chicken stock, orange juice, vinegar, fish sauce, chipotle peppers) into the pot and stir constantly to avoid the mixture from boiling. I like to add the adobo sauce here as well for an even bolder flavor, but it's not required. After 10-15 minutes, the chilies will soften and the color of the mixture will change from orange to a deep reddish brown. When the chilies are soft, set the pot aside to cool down. Take the pork shoulder and cut it into 2-3 inch chunks then place it in the skillet to brown. Once browned, place the meat in the crockpot. Chop the onion and brown that in the skillet along with the garlic. I like to use Californian Avocado oil because it doesn't burn like olive oil, so it's healthier and easier to clean up too. Once the onions are slightly caramelized, place them in the crock pot with the pork. The chili mixture should now have cooled down, so place that in a blender till it is finely blended into a sauce. Pour that sauce over the pork and onions and mix everything together so the pork is entirely coated with the chili sauce. Place the lid on the pot and cook on low for 5-6 hours. When you open the lid, you are going to be greeted with a bold flavor of New Mexico chilies and roasted pork that will simply blow you away. However, as good as it is to eat immediately, I would suggest that you let it cool down and then try it the next day since like most recipes with bold and complex flavors it can take some time for everything to come together. Ultimately it's your call though! The great part about this recipe is that you can serve it however you want! It works great served as nachos with chips, sour cream and a bit of cheddar cheese or tacos or even just by itself. That part is up to you, so be bold and try new ways to enjoy your food.